Back in the day I guess it made sense; one camera that could use both 35mm and 120mm film. Nowadays, with an abundance of cheap, 35mm camera options I can't imagine why you would be tempted to put 35mm film into a 6x6 TLR camera. Doing so gives you the main disadvantage of the 35mm format (smaller negative) with all the disadvantages of a 6x6 TLR (reversed viewfinder, slow to use and tricky to focus). 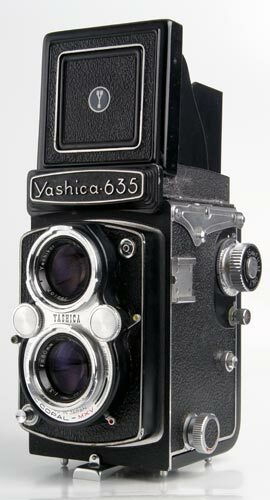 At the tail end of the 60's the 635 was Yashica's dual format camera. Today it is still worth using, just not with 35mm film. The 635 is basically a Yashica D with the added complication of a 35mm film advance (and rewind) mechanism. A little less common than the D and sporting that 'dual format' strap line the 635 is a little more sought after than the D by collectors. That doesn't make it rare though, and when I stumbled across one locally in CraigsList for $35 I didn't have to fight off a hoard of other buyers to get it. The camera was dirty but functioning when I picked it up. It was missing the magnifier from it's finder but I had a worthless Yashica E lying around that I'd picked up for it's novelty value. It was a simple matter to transfer the magnifier from the E to the 635. While I was about it I swapped the fresnel focusing screens over too; as I had no intention of using 35mm film in my 635 the red frame lines in the viewfinder were a distraction I wanted gone. This simple customization also allowed me to clean both the mirror and the focusing screen (easy does it) with a little windex. The resulting viewfinder image was sharper and brighter, although not by much. So, how does the 635 perform? The 635 lacks the film crank and the auto-shutter cocking of my Mat. More importantly it sports the 3 element Yashikor lens rather than the Mat's more refined 4 element Yashikon. Truth be told, the lens difference makes less of a difference than you might think. Below f8 the 635 is certainly softer than the Mat but you can use that to your advantage for portraits. At f8 and above it is very hard to tell them apart. Less professionally featured than the Mat, the 635 is a little slower to use but, when I need speed, I more likely to pick up a digital camera anyway, Using a TLR is all about slowing down and considering everything that you're doing. The 635 helps me in that endeavor and is, as such, a useful arrow to have in my quiver. $35 is very little money to spend on a useable medium format camera. Lomography.com will sell you a Holga for $10 more, a Lubitel for $90 more, or a Seagull for $165 more. I've spent much more on a single book than I have on this camera. While everyone is practically giving away their old film gear I recommend that you keep your eyes open for an old D or 635; a better bargain is hard to find. Nice camera.. I had a mint 635 with Yashinon lenses.. rare. Most come with the Yashikor. Like an idiot, I sold it on ebay. It was a damn sharp lens, I've been kicking myself for over a year, just bought an old Yashica-Mat on ebay, very nice, with Lumaxar lens. Sending it to Mark Hama for CLA this week. These old Yashicas are gems -- 120 film will always be around, I'll put some Velvia through it when it comes back. Great for street photography too. People don't associate you holding something at waist level and looking down, as having their picture taken. 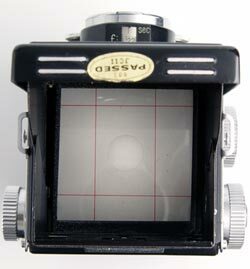 Of course, I'd love to have a Rolleiflex, but the Yashica is a low cost, no risk 'fun' camera. If you want to buy it I will send a photo for camera. I enjoyed reading about your Yahshica 635. I just recently purchased a Yashica 635 off of ebay for $35, as well. Unfortunately I don't hardly know much about medium format cameras but I would really like to, since how I own three of them now. I want to go beyond digital with my photography. Would you like to help in any way? I've a yashica 635 camera and I was plundering the google to see prices to sold it, 'cause I don't give it many use now since digital era. I accidently read your post and it made me consider the small jewell I've got back home. Thank you for saving it. Just reading your article about the Yashica 635.. I found the same model, in its original case, sitting on a shelf in my study..didn't even know it was there!! Just wondering if you would be interested in buying it from me, since you seem to be an avid fan of them?! 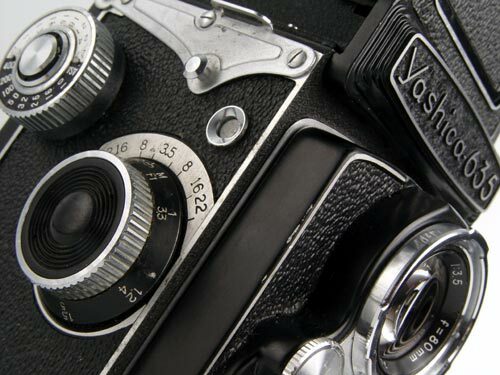 dear fellow yashica collector,i was given a 635 kit by an old church friend of mine he since has died at the age of 89. he bought it in germany in 1958 in was 11 pounds. i have always wanted one but did not have, he offered me this one after seeing my old camera collection. the old cameras are so well made not like the plastic rubish made for the hard working class jeff harrison..an old young eggsentric from the old school. In the past 2 years I have purchased 5 Yashica TLRs. The first, a MAT 124G, was adopted by my daughter. The second was a 635 w/Yashikor lenses. Numbers 3 and 4 were parts cameras. Yashinon lenses from a later model 124G were fitted into my 635 and the remaining parts plus a few of Mark Hama's got the MAT 124 in A1 working condition. My son now uses it. Number 5 was an old MAT w/Lumaxar lenses with I use for B&W. An 'ol guy like myself tends to lean toward the older, all metal models. Photos taken with the 635 and old MAT can be seen by clicking the Old Camera Knot. Comments and constructive criticism welcome. Has anybody got an adapter kit (35mm.) for the 635 for sale ? part of mine is broken, (the bit with the bakelite fingers that fit into the 35mm. film) I would gladly pay a reasonable price. I am located in Ireland. Several years ago I bought a 635 w/a complete 35mm kit in the same condition at a rummage sale for $20. This camera is in nearly pristine condition, having only a couple of minor blemishes on the pressure plate. McKeowns 10th edition (97/98) lists it at $150 - $225. Without the kit, $80 - $120. Martin Taylor is right; a good 635 is well worth the low cost mentioned in Aimees' post. My 635 is not for sale. I have a Yashica 635 that has film in it . Can anyone tell me how to get the exposed film out of the camera ? Anyone interested buying Yashica 635? I have 3 pcs on hand and believe me, well preserved (sitting on their leather cases). I don't know how to use it but I assure you, 2 out of 3 are still "brand new" (never been used - plastic covers are still there). I heard from my friend that these are expensive units... I am planning to sell as "lot".